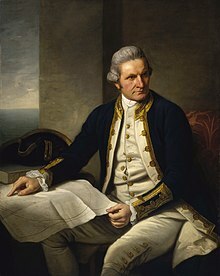 Captain James Cook, FRS (27 October 1728 – 14 February 1779) was an English explorer, navigator and cartographer. At this time, because England had already united with Scotland to form Britain, he is also called a "British explorer". He made three voyages to the Pacific Ocean, mapping many areas and recording several islands and coastlines on European maps for the first time. He is most notable for the British finding the east coast of Australia, finding the Hawaiian Islands and the first mapping of Newfoundland and New Zealand. During his lifetime, he sailed twice around the world. He crossed the Antarctic Circle and found new islands and landscapes in North America and the South Pacific. During his trips, he spent a lot of time on science experiments, and mapping new areas. He also wrote a lot of books about what he found. Cook was born on 27 November 1728 in Marton in Yorkshire. He was a son of a Scottish farmer. He was educated at the school in Great Ayton, and at 17 he began work in a shop at Staithes. At 18, Cook became a sailor, and became an apprentice to John Walker of Whitby. Walker's business was transporting coal. Cook learned mathematics and navigation from Walker. Cook was not just a normal seaman. He studied as much as he could about navigation and science. He was sent on three expeditions with the ship called Endeavour all over the world. to find new routes between the Pacific and the Atlantic. ↑ 1.0 1.1 1.2 1.3 "Cook, James (1728-1779) Biographical Entry". Australian Dictionary of Biography On Line Edition. Australian National University. 1966. Retrieved 2010-05-28. ↑ "james cook family - Google Search". www.google.co.tz. This page was last changed on 27 March 2019, at 14:40.